2018 marks the fifth year of Unlocking Detention. This timeline tells the story of immigration detention reform during the time it has been running. We will be releasing one year of the timeline at a time as we progress through #Unlocked18. Over 70 MPs from all major parties support an amendment to the Immigration and Social Security Coordination (EU Withdrawal) Bill calling for a 28 day time limit on immigration detention, to be considered during the Report Stage. The Home Affairs Committee publishes its long-awaited report on immigration detention, calling for a 28 day time limit, an end to the detention of vulnerable people, automatic judicial oversight of decisions to detain, and alternatives to detention. MPs from all major parties tabled an amendment to the Immigration and Social Security Coordination (EU Withdrawal) Bill calling for a 28 day time limit on immigration detention, which was debated by the Public Bill Committee. The Joint Committee on Human Rights publishes its report on immigration detention, calling for far-reaching reforms including a 28 day time limit and independent authorisation of decisions to detain. Lord Ramsbotham is named fifth ‘Detention Forum Champion’, honouring his long-standing commitment to reforming the immigration detention system. Tulip Siddiq MP presents a ten-minute rule Bill calling for a time limit on immigration detention, with cross-party support. Immigration Minister Caroline Nokes announces an alternative to detention pilot for women who would otherwise potentially be detained. Caroline Spelman MP and Baroness Sally Hamwee are named Detention Forum Champions in recognition of their commitment to detention reform. The government announces that Campsfield House IRC will close in May 2019, the fourth IRC to close since Unlocking Detention began. Unlocking Detention 2018 is launched, with a focus on encouraging people to take action towards detention reform. The Detention Forum publishes a working paper answering questions around a 28 day time limit on immigration detention. Following its inquiry into the detention of the Windrush generation, the Joint Committee on Human Rights launches an inquiry into immigration detention in the UK. The government publishes Stephen Shaw’s second review of immigration detention and announces its response, including an internal review of time limits on immigration detention in other countries and a pilot alternative to detention project for women who would otherwise be detained in Yarl’s Wood IRC. The Detention Forum places Shaw’s second review in a broader context of growing media and political interest in detention reform. The British Red Cross publishes evidence of the humanitarian impact of immigration detention in Never truly free, announcing its support for a 28 day time limit. The Detention Forum publishes a briefing on FAQs around Alternatives to Detention. MPs Paul Blomfield and Stuart McDonald are named Detention Forum Champions for their tireless work in advocating for detention reform. Amber Rudd resigns as Home Secretary after misleading Parliament over deportation targets amidst the Windrush and Hostile Environment scandal. She is replaced by Sajid Javid. The Home Affairs Committee broadens its inquiry to address immigration detention as a whole. 100 women begin a hunger strike in Yarl’s Wood IRC, calling for detention reform including a time limit. Key provisions of the Immigration Act 2016 come into force, including changes to bail and post-detention accommodation. Caroline Nokes MP becomes Immigration Minster, replacing Brandon Lewis MP. Amnesty International publishes A matter of routine, arguing for a move away from the UK’s reliance on immigration detention. The Bar Council publishes Injustice in immigration detention, calling for automatic judicial oversight and a time limit on immigration detention. The British Medical Association publishes Locked up, locked out: Health and human rights in immigration detention, calling for a time limit on detention. 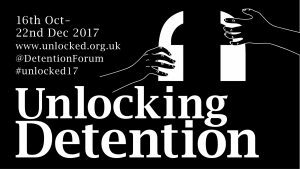 As part of #Unlocked17, the Detention Forum hosts a parliamentary meeting on immigration detention featuring experts-by-experience and current research. Women for Refugee Women publishes We are still here, arguing that the government’s Adults at Risk policy is failing to safeguard and protect vulnerable women in immigration detention. Unlocking Detention 2017 is launched, encouraging people to take action towards immigration detention reform. The Home Office announces the closure of The Verne IRC, only three years after it opened. The reduction of 580 detention bed-spaces represents about a 20% decrease in the UK’s immigration detention estate. Following legal action by Medical Justice and others, the High Court rules the Government’s new definition of torture in immigration detention policy unlawful. Prompted by Panorama’s revelations, the Home Affairs Committee launches an inquiry into the running of Brook House IRC. The BBC’s Panorama programme ‘Undercover: Britain’s immigration secrets’ features extensive undercover footage from Brook House IRC. The Freed Voices, a group of experts-by-experience campaigning for immigration reform, publish a response to this. Brandon Lewis MP becomes Immigration Minster, replacing Robert Goodwill MP. Labour and the Liberal Democrats again pledge to end indefinite immigration detention in their election manifestos. The SNP’s manifesto includes a commitment to a 28 day time limit. Women for Refugee Women publishes The way ahead: An asylum system without detention, arguing for alternatives to detention. Unlocking Detention 2016 is launched, this year focusing on friends, families and communities affected by detention. Detention Action publishes Without detention, outlining the strategy for developing and implementing community-based alternatives to detention to radically reduce the use of detention. HM Chief Inspector of Prisons publishes its annual report summarising findings from 2015-2016, including inspections into Dungavel, Harmondsworth, The Verne, Tinsley House and Yarl’s Wood IRCs. Following the Parliamentary Inquiry and Shaw Review, HMIP decides to formally call for a time limit on immigration detention. Robert Goodwill MP becomes Immigration Minster, replacing James Brokenshire MP. Amber Rudd is appointed Home Secretary following Theresa May’s appointment as Prime Minister. The Home Office implements new guidance on adults at risk in immigration detention, which ‘aims to strike the right balance between protecting the vulnerable and ensuring the maintenance of legitimate immigration control’. Following growing disquiet about immigration detention and a last-minute ping-pong regarding a proposed time limit amendment, the Immigration Act 2016 introduces changes to immigration detention policy including automatic bail referrals after 4 months for certain people, changes to post-detention accommodation, and a time limit for pregnant women. In the lead-up to the 2016 Immigration Bill, the Equality and Human Rights Commission supports the Parliamentary Inquiry’s recommendation of a 28 day time limit. The Home Office publishes Stephen Shaw’s ‘Review into the Welfare in Detention of Vulnerable Persons‘, which calls on the government to reduce the size of the detention estate ‘boldly and without delay’. In response, Immigration Minister James Brokenshire announces changes designed to reduce the scale of detention and improve the welfare of people who are detained. The Supreme Court refuses the government permission to appeal against the Court of Appeal’s decision of 29 July, marking the end of the road for the Detained Fast Track. Members of the National Preventive Mechanism ‘reach a common position on the need for a time limit on immigration detention’. The Home Office announces the closure of Dover IRC, explaining that it was not compatible with a detention estate of ‘modern, secure centres located with easy access to the airports from which removals take place’. As part of its global ‘beyond detention’ strategy, the UNHCR publishes a national action plan for the UK, raising concerns about the scale of immigration detention and lack of time limit. The International Detention Coalition publishes There are alternatives: A handbook for preventing unnecessary detention. Unlocking Detention 2015 is launched, taking people on a virtual tour of the detention estate for the second year running. MPs endorse the findings of the Parliamentary Inquiry into immigration detention. The UN Human Rights Committee calls on the UK government to introduce a time limit on immigration detention. The Detention Forum publishes Rethinking Vulnerability in Detention. Immigration Minster James Brokenshire announces that the Home Office is suspending the Detained Fast Track. The High Court quashes the Detained Fast Track asylum appeals process, meaning that those seeking asylum can no longer be detained simply for the purpose of quickly assessing their claim. Labour and the Liberal Democrats pledge to end indefinite immigration detention in their election manifestos. Haslar IRC closes its doors, the first in a string of closures to come. The House of Lords debates the report of the parliamentary inquiry into the use of detention. Following a Channel 4 investigation into Yarl’s Wood IRC, protests and hunger strikes break out in several IRCs. Protestors call for an end to the ‘indefinite deprivation of liberty and human rights’. The Parliamentary Inquiry into immigration detention publishes its report, concluding that ‘we cannot go on as we are’. It finds that ‘the UK detains too many people, for too long a time, and that in far too many cases people are detained completely unnecessarily’. It recommends a time limit of 28 days and the implementation of community-based alternatives to detention. Theresa May announces a review of welfare in immigration detention, led by former Prisons and Probation Ombudsman Stephen Shaw. The Detention Forum calls for a moratorium on the expansion of the detention estate, following the announcement of a plan to double the size of Campsfield IRC. The plan was later dropped. AVID releases Hidden Stories, documenting ‘the relationships that are built through volunteer visiting and the difference this can make to both volunteer and visitor’. Detention Action, with input from experts by experience, publishes The State of Detention. The first Unlocking Detention is launched, using social media to challenge the ‘out of sight, out of mind’ approach that has allowed the cruelty of immigration detention to remain hidden. The High Court finds the Detained Fast Track process to be operating with an ‘unacceptable risk of unfairness’ following legal proceedings brought by Detention Action. A Parliamentary Inquiry into immigration detention is launched by the All Party Parliamentary Groups on Refugees and Migration. Advocates and experts by experience give oral evidence. The Immigration Act 2014 introduces sweeping new measures forming the backbone of the ‘hostile environment’.